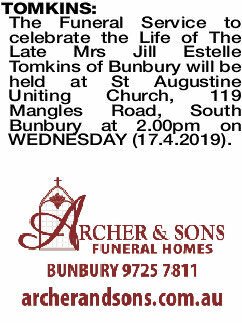 The Funeral Service to celebrate the Life of The Late Mrs Jill Estelle Tomkins of Bunbury will be held at St Augustine Uniting Church, 119 Mangles Road, South Bunbury at 2.00pm on WEDNESDAY (17.4.2019). Deepest sympathy to Judy, David, Ian and Peter on the passing of Jill our family friend of many years. Jill was our bridesmaid 60 years ago and it was our pleasure to enjoy her company at our get together. I am sorry we can not attend her funeral as we are in the Eastern States. Our love to all her family. TOMKINS JILL Passed away peacefully at home on 09.04.2019. Devoted mother and much loved by Michelle, Helen, Kylie and Christopher. Grandmother to Tom, Jarrad, Jaime, Brendan, Lilli, Cohen, Owen, Tirra, Jasmine and Oliver. You will be forever in our hearts. Loved sister of David, sister-in-law of Coral, aunty of Jacky, Tim and Brooke. Always the nurse who cared for all. Though couldn't be saved from the dreaded cancer. Deepest sympathy to the girls and Chris. Fond memories of the good times. RIP Jill. Dearly loved sister and sister-in-law of Ian and Di, aunty to Megan, Ben, Louise and Jenna. You fought a wonderful fight, one you could not win. At peace now. God bless. 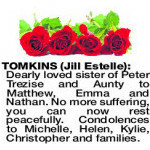 TOMKINS JILL ESTELLE Dearly loved sister of Peter Trezise and Aunty to Matthew, Emma and Nathan. No more suffering, you can now rest peacefully. Condolences to Michelle, Helen, Kylie, Christopher and families. 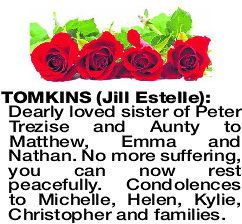 TOMKINS JILL In loving memory of our dear sister who will be sadly missed. Heartfelt sympathy to Michelle, Helen, Kylie, Chris and their families who supported her with such loving care. Deepest sympathy to our dear cousins Michelle, Helen, Kylie, Christopher and families for their loss. Aunty Jill will be sadly missed. So many fond memories. Love Natalie and Tim, Brett and Renee, Trenton and Karina, Zak and Connor. A caring, kind and loving person to all. A true friend. Our thoughts are with all the family. Elaine, Laurie and family.